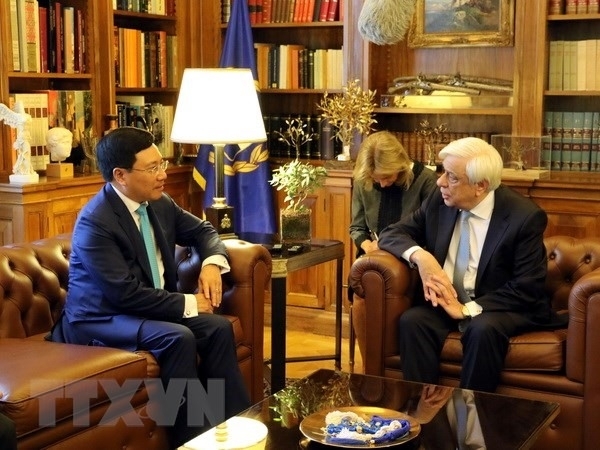 Greek President Prokopis Pavlopoulos has affirmed his support for enhancing all-round co-operation with Vietnam during his reception for visiting Vietnamese Deputy Prime Minister and Foreign Minister Phạm Bình Minh on Monday. He said with its location and achievements, Vietnam has played an increasingly important role in the region and the world. Lauding Minh’s official visit to Greece from Sunday to Monday, the host said the trip will help boost bilateral ties. For his part, Minh expressed his wish for further friendship between the two countries by increasing high-ranking delegation exchanges and high-level meetings, as well as expanding co-operation in the fields of economy, trade, investment, culture and tourism. The official conveyed President Trần Đại Quang’s invitation to President Pavlopoulos to pay an official visit to Vietnam, which he accepted. On regional and global issues, host and guest affirmed their support for the enforcement of international law, and agreed to join hands for peace and stability in the region and the world. During his visit, Deputy PM and FM Minh met with Greek Deputy PM and Minister of Economy and Development Giannis Dragasakis. The two sides agreed that although bilateral trade climbed from US$196 million in 2015 to $335 million in 2017, it has failed to match the potential and aspirations of both countries. They suggested stepping up collaborative efforts in areas like maritime transportation and logistics, shipbuilding, seaport exploitation, tourism and agricultural product processing. Minh called on the Greek government and firms to increase business and investment activities with Vietnam, and the chambers of commerce of the two countries to organise business forums. 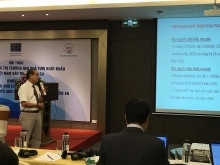 Vietnam stands ready to work as a bridge helping Greek enterprises enter Southeast Asia and Asia-Pacific markets, he stressed. Giannis Dragasakis said as a gateway to Europe, Greece wants to strengthen collaboration with Vietnam, and backs the early signing of the EU-Vietnam Free Trade Agreement. Greece is willing to share its experience with Vietnam in tourism, seaport management and exploitation and maritime transportation, he said. The two sides agreed to create a legal framework to promote bilateral economic and trade ties, including negotiations for the signing of an agreement on double taxation avoidance, and another agreement on maritime transportation. While in Greece, Minh met with Greek FM Nikos Kotzias, during which they noted the fruitful bilateral friendship across several fields over the past 40 years since the two countries set up diplomatic ties. The two sides should hold more meetings to improve mutual understanding, and roll out measures to advance bilateral ties, they said. The officials agreed to continue to realise the memorandum of understanding on tourism co-operation between Vietnam and Greece, while forging partnerships in education and training, archaeology and culture. They also consented to increase exchanges between the two foreign ministries and exchange officials specialising in international relations and maritime laws, while enhancing co-ordination at regional and international forums. Minh urged the Greece to create conditions for the Vietnamese community in the country to have a stable legal status and integrate into the host society. Following the talks, the officials reached a bilateral agreement on visa exemption for diplomatic passport holders. Deputy PM and FM Minh also had a meeting with the staff of the Vietnamese Embassy and representatives of the Vietnamese community in Greece.